I was looking through a local Brides Magazine and came across 2 very cool and very Philadelphia type ideas. What doesn't say The City of Brotherly Love other then the soft Pretzel and Yummy Gelato! Philly Soft Pretzel Factory is now offering pretzels to be served at your reception and they will even customize them with your names and wedding date. Very reasonably priced. 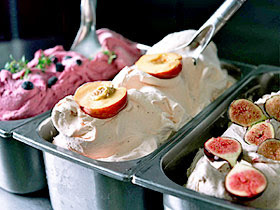 Capogiro Gelato Artisans will put a cart at your reception and serve your guests. They have 346 flavors to pick from, how about a white chocolate or a raspberry. Rental fees start at $1000. I think these are two great ways to add another layer of personalization to your wedding.